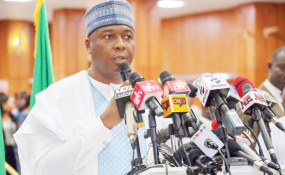 Senate President, Dr, Bukola Saraki has been named the Director-General of the campaign of the Presidential candidate of the Peoples Democratic Party (PDP) Alhaji Atiku Abubakar. In a confirmation to THISDAY, the National Publicity Secretary of the party, Kola Ologbondiyan, also said that the Sokoto and Rivers states Governors, Aminu Tambuwal and Nyesom Wike have been also named as zonal coordinators for North-West and South-South respectively. Immediate past Governor of Ekiti state, Ayo Fayose was named as the coordinator for South-west. The party's spokesperson also said that while the Governor of Akwa Ibom State, Emmanuel Udom, was appointed Chairman of Fund Raising Committee, the former presidential aspirant, Alhaji Taminu Turaki, would head the legal committee. He also said that others campaign officials would be announced in due course.